Everyone i know has trouble getting up from bed in the morning, maybe the snooze button is to easy to push. Maybe its just too cheap to push it? Atleast thats what the “snooze” app thinks, for everytime you push the snooze button you have to pay 25 cents, a small value, but it builds up over time. but dont think the developers take your small change, at the end of the month, the app tells you how much you’ve pledged and makes it easy to donate the pledge to your selected charity. That concept motived the snarky folks at ThinkGeek to dream up a concept for the SnūzNLūz alarm clock, which flips the incentives. You pay to causes that you hate with each snooze use. “Are you a butcher? Set your SnūzNLūz to donate to PETA! Are you a Republican? Set your SnūzNLūz to donate to the ACLU!” they write. 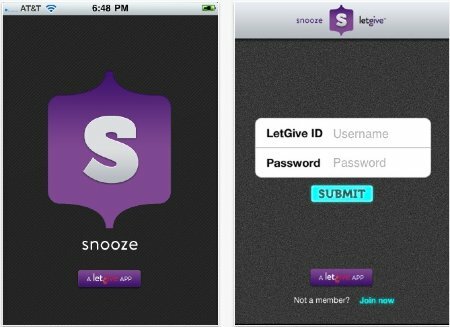 Clever satire, but there are many other potential uses for LetGive’s concept of integrating donations within daily usage apps. We’re eager to see what they come up with next.